As an experienced eating disorder therapist, I commend Natenshon for taking on this task of organizing her life's work and letting other professionals into her storehouse of knowledge. Having developed her own system of treating eating disorders through years of experience, she has generously taken the time to methodically detail what she has learned, and share the experiences that have pointed her in this direction. Natenshon’s personal journey offers solid guidance in the specialty of eating disorders, available to mental health professionals in Doing What Works: an integrative system for the treatment of eating disorders from diagnosis to recovery. Her writing is thoughtful and knowledgeable, and her sharing of interesting anecdotal materials makes the read compelling and engaging. Her emphasis on the unique treatment requirements of working with people suffering from eating disorders is absolutely A+. Pointing out how exceedingly complex these disorders are, and offering clinicians strategies to manage these complexities in treatment, suggests both the good news, and the bad....that eating disorders are eminently treatable all the way to complete recovery, but only for the therapist with the maturity, professional skills, patience, creativity, and inexhaustible empathy required to transform an irrational, counterintuitive and sometimes seemingly intractable disorder into the realm of the understandable and the treatable. Natenshon’s sensitive and respectful treatment guidelines lead to significant improvements in care, setting the stage for recovery. The book speaks to the beginning therapist as well as to the highly experienced. Chapter 3, Soul Searching: Assessing the Personal Side of Professional Challenges offers personal assessments, providing readers incentives for introspection and self-exploration in considering a specialty in this field. "How did you feel about your body while growing up?" "What messages did you get from your parents about how people are supposed to look?" Such questions, and the personal insights that come of them, offer the kind of personal and professional self-awareness that is central to skillful management of counter-transference issues. Natenshon’s inclusion of the DSM diagnostic materials as they relate to the associated causes and effects of eating disorders provides good basic information for novice practitioners. 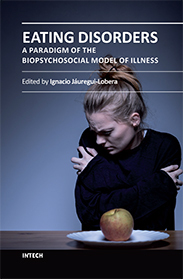 It points to the uniqueness and complexity of the eating disorder diagnostic process, creating an awareness of the expansive and integrative nature of the disorder and its impact on lives, and the need for an equally expansive and integrative perspective on healing. Natenshon skillfully links some of the latest information on the relevancy of neuropsychology and brain plasticity to eating disorder treatment in Chapter 11, As the Brain Learns, People Change: Innovative Treatment Approaches. As a practitioner in this field, I am well aware that the most intractable eating disorders connote lives hijacked by the structure and function of a brain obsessed with thoughts about food, weight and body image. Mindfully present therapeutic connections facilitate the creation of new neuronal pathways which become instrumental in helping patients to change their internal dialogue and sustainably reclaim cognitive space and healthful behavioral function. One of the most helpful and practicable sections was Chapter 7, Diagnosing and Managing Eating Disorders, Feeding Disorders, and Picky Eating Syndrome in Young Children. Here, Natenshon provides rich information, helping professionals to recognize issues of frequently misunderstood and vastly under-diagnosed early childhood eating and feeding dysfunctions that first appear in infants and latency age children. In offering empowering diagnostic skills and a wide variety of tools and strategies for parents and pediatricians, this chapter’s thoroughness is outstanding. Overall, I most appreciated how personal Natenshon’s voice is throughout the book. She is a clinician and she has filled the book with information for clinicians. The personal anecdotes, email exchanges and case studies she provides are the raw materials for which every clinician hungers. Her willingness to include the conversations that go on, both inside and outside of the treatment room, is a gift. These interactions can be heartbreakingly sad as well as powerfully life changing. There is no sugar-coating; the reality is that there cannot always be successful outcomes in working with these extremely complex disorders. A bottom-line message comes across clearly; successful treatment has to include parents and families as part of the treatment team -- the younger the child, the more imperative this is. This essential message cannot be overstated. No one heals from an eating disorder alone. Particularly when a child resides in a parental home, the availability of an enlightened person to turn to in the next room is key to a successful outcome. Even when the patient is an adult, parental support can be a great asset in achieving recovery. Though the work of the multi-faceted and multi-disciplinary professional team is critical, the life-line to recovery resides within the patient’s trusting relationship with the therapist. The therapist needs to be versatile enough to play the roles of mentor, educator, liaison, cheerleader and authoritarian case manager, by intention and default. Natenshon has done an outstanding job of covering the bases. For the novice, the book is a great introduction to this field. For the experienced therapist, there is the gift of seeing how it is done by a seasoned colleague. The ideas presented and the people who have been touched by them have seen outcomes that have worked. This book deserves to be used and appreciated as a basic resource for eating disorder management and treatment. Though at occasional points throughout the book, the reader needs to sift through the publisher’s poorly edited and formatted text, there is a quantity of quality pearls buried here that are truly worth the dig. Edye Kamensky, LCPC, is currently a staff psychotherapist at The Family Institute at Northwestern University and is a former supervising psychologist at The Renfrew Center. 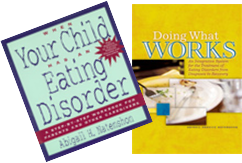 Doing What Works is the first book of its kind to offer novice and veteran practitioners a coherent and sequential system for approaching, treating, and effectively managing complex eating disorder cases, from start to finish. Highlighting the unique qualities that set eating disorder treatment apart from generalist practice, Natenshon synthesizes evidence-based eating disorder research and best-practice treatment protocols into innovative and practicable clinical applications 'that work,' offering a fully integrative approach to eating disorder care. Bringing the field into the 21st century, Natenshon cites recent neurobiological research to underscore the significance of a unique and versatile use of the therapist's self within the treatment relationship. Her work is also pioneering in explicating the power and significance of mindfulness in psychotherapy practice, as well as the role of interpersonal neuropsychology and brain plasticity in enhancing healing. In the seasoned voice of an expert who has specialized in the treatment of eating disorders for close to four decades, Natenshon's book speaks to the entire multidisciplinary treatment team… including nutritionists, physicians, school personnel and families, filling in extensive gaps in professional education. The book offers clarity, vision, intention, and optimism to practitioners striving to meet the rigors and challenges of managing diagnostic ambiguity, complex transference issues, persistent patient resistance, and daunting co-occurring conditions within a highly counterintuitive recovery process. Aside from honing treatment skills, this reader-friendly treatment guide provides clinicians the opportunity and confidence they need to become self-starters within a demanding treatment process--while helping their patients to do the same.